I had dinner with my good friend Rod the last evening I last visited the Palouse. We talk about how much I valued the time he took me to the Garfield Cemetery and told stories about friends and family that were buried there. It was during those moments that I realize just how special it is to live in a place where your roots run deep. Why your word matters and why honoring a handshake deal is so important. After dinner the clouds were forming at the horizon in a way that made me believe the sunset would be fabulous. Since I was close to Colfax I decided to remember this evening by capturing the sunset in the Colfax Cemetery. As I walked around I discovered a statue of a little boy who died at the age of 7. I decided my image would honor the memory of this child. So I composed the shot, tapped the button in ProHDR and spent the next few seconds admiring the golden rays. After ProHDR did its magic of combining the two image, I tapped the save button and finally saw the image. 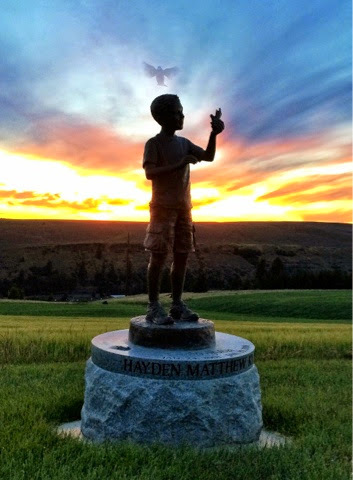 A silhouette of a bird was perfectly places above the little boy's head. I then looked at the statue with no bird in sight and then back at the captured image. The moment warmed my heart and I felted blessed to truly be in the right place at the right time. Rod called me just a minute ago. He asked how I enjoyed the sunset. I told him my story and he thought it would be wonderful if I printed this image for the boy's parents. I told him I would. I am delivering the framed print this weekend. Such a wonderful day it was!